Our range of products include bosch lbd-1935, 240 watt booster amplifier, bosch lbd-1938, 480 watt booster amplifier, bosch pln-2aio180-in 180 watt mixing amplifier, bosch pln-2aio360-in, 360w all in one mixing amplifier, bosch lbd-1930, 120 watt booster amplifier and bosch ple-1me060-2in, 60 watt mixing amplifier. The 240 watt Booster amplifiers are powerful power amplifier in a 19”case 3U housing for rack mounting or tabletop use. The Bosch booster amplifier series with its varied amplification range fulfills a wide variety of public address requirements at a surprisingly low cost. The amplifier is protected against overload and short circuits. The system has two balanced inputs with priority control, each with a loop-through facility. This makes it easy to connect remote systems that require priority control. An additional 100V line input is provided to connect the amplifier to a 100V loudspeaker line to provide more power to remote locations. The amplifier has 70V and 100V outputs for constant voltage loudspeaker systems, and a lowimpe dance output for 8 ohm or 4 ohm loudspeaker loads. The 480 watt Booster amplifiers are powerful power amplifier in a 19”case 3U housing for rack mounting or tabletop use. 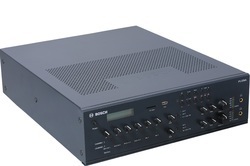 The Bosch booster amplifier series with its varied amplification range fulfills a wide variety of public address requirements at a surprisingly low cost. The amplifier is protected against overload and short circuits. The system has two balanced inputs with priority control, each with a loop-through facility. This makes it easy to connect remote systems that require priority control. An additional 100V line input is provided to connect the amplifier to a 100V loudspeaker line to provide more power to remote locations. The amplifier has 70V and 100V outputs for constant voltage loudspeaker systems, and a lowimpedance output for 8 ohm or 4 ohm loudspeaker loads. The PLENA all-in-one mixer amplifier is a versatile solution for public address, emergency announcements and back-ground-music (BGM) requirements. This high-performance device is easy to install and operate. The All-in-one amplifier is mixer amplifier with inbuilt music source.The All in one unit can provide hours of uninterrupted music from USB or SD flash memory.The unit also has a built in FM tuner with presets. To ensure for optimum performance, the All in one unit has no moving parts, such as hard drives that can fail or wear out. 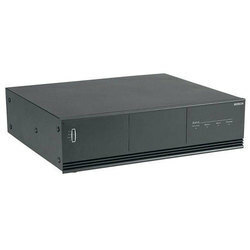 The unit is supplied with an IR remote control for controlling the music source.The unit can be rack mounted by using the brackets that can be procured seperately. The mixer amplifier has four microphone inputs. Separate level controls are available for all the inputs. For all the inputs (except Aux input), phantom power can be switched on to provide power to condenser microphones. Inputs 1 and 2 can be configured between line and mic level sensitivity. Inputs 3 and 4 are for connecting microphone only. Microphone inputs 1 and 2 have a combo connector so that both XLR and 6.3mm TRS connectors can be used for connecting microphones.Other microphone inputs are standard XLR connector. The mixer amplifier has two zone outputs. The music can be switched on and off in the zones via the front panel. Announcements from the PLE-2CS two-zone call station can be routed to zone 1 or zone 2, or both. Announcements from the Telephone/100 V input is routed to both zones and can override the microphone and PLE-2CS signals. The 120 watt Booster amplifiers are powerful power amplifier in a 19”case 3U housing for rack mounting or tabletop use. The Bosch booster amplifier series with its varied amplification range fulfills a wide variety of public address requirements at a surprisingly low cost. The amplifier is protected against overload and short circuits. The system has two balanced inputs with priority control, each with a loop-through facility. This makes it easy to connect remote systems that require priority control. An additional 100V line input is provided to connect the amplifier to a 100V loudspeaker line to provide more power to remote locations. The amplifier has 70V and 100V outputs for constant voltage loudspeaker systems, and a lowimpedance output for 8 ohm or 4 ohm loudspeaker loads. 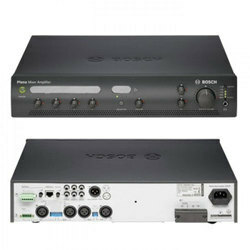 These Plena Economy mixer amplifiers are professional public address units with modern stateoftheart features. They are easy to use, taking the complexity away from the user and putting it where it belongs, inside the equipment. Providing a crisp call or clear music is as easy as turning on the radio. Offering the essentials of public address in an affordable package. 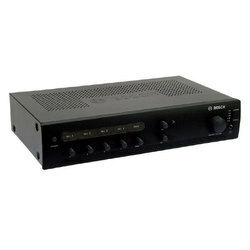 Looking for Bosch Plena Amplifiers ?